Henry Danger is getting a makeover. This week, Nickelodeon announced they’ve ordered a new animated series based on the popular live-action show. Titled The Adventures of Kid Danger and Captain Man, the cartoon will follow “the heroic Kid Danger and Captain Man as they face new adventures—battling bizarre criminals and super villains with their sharp wit and amazing crime-fighting skills.” The cast of Henry Danger, which includes Jace Norman, Cooper Barnes, and Riele Downs, will reprise their roles for the animated series. NEW YORK–March 2, 2017—Nickelodeon, the number-one kids’ network, has greenlit The Adventures of Kid Danger and Captain Man (working title), a brand-new animated series based on characters from TV’s number-one kids’ series, Henry Danger. 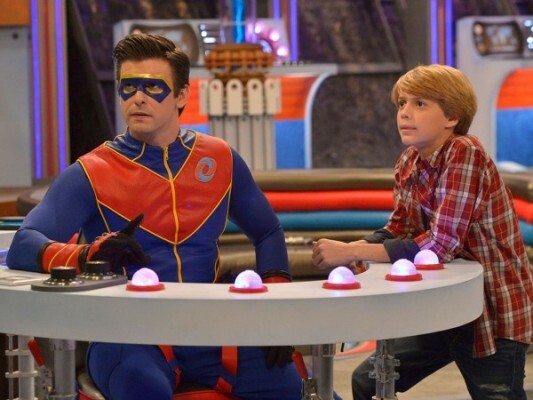 Created and executive produced by hitmaker Dan Schneider (Henry Danger, Game Shakers, iCarly), the half-hour series has been picked up for an initial order of 10 episodes and follows the heroic Kid Danger and Captain Man as they face new adventures—battling bizarre criminals and super villains with their sharp wit and amazing crime-fighting skills. The news was announced at Nickelodeon’s Upfront presentation, held today in New York City. The Adventures of Kid Danger and Captain Man first found life as a Nickelodeon short-form digital series, also created by Schneider, which has been viewed more than 30 million times worldwide across multiple platforms. While the live-action hit focuses on Henry balancing the challenges of being a teenager with his adventures as a crime fighter, this new full-length animated series centers on his exploits as Kid Danger, as he embarks on brave new missions with Captain Man to battle monsters, aliens and more. The Adventures of Kid Danger and Captain Man is produced by Powerhouse Animation, which also produced the short-form series. The live-action Henry Danger, which was 2016’s number-one kids’ show on all TV, was renewed last year for a fourth season (20 episodes). New season three episodes will continue to air Saturdays at 8 p.m. (ET/PT) on Nickelodeon. In the new animated series, brand-new areas of the superheroes’ headquarters will be seen by fans for the very first time, including the Man Cave tube system, which propels the crime fighters into adventure; and the Man Cave garage, filled with crime-fighting vehicles and gadgets used on missions. Along with appearances of fan-favorite characters from the live-action show, new friends and foes will also be introduced. What do you think? Are you a fan of Henry Danger? Will you watch the new animated series? I do not like animated programs and prefer live action. Not likely to watch.